Are you considering a sunroom addition but aren’t sure which style is best for your home? A solarium is an excellent sunroom option that provides a wonderful way to enjoy the beauty of the outdoors without leaving the comfort of your home. A solarium is a type of sunroom that allows you to enjoy the health benefits of the sun without being directly exposed to the outside elements. Patio Enclosures® solariums feature glass roofs and glass walls that provide floor-to-ceiling views of the outdoors. If you enjoy being surrounded by nature from the comfort of your home, a solarium may be the perfect option for you. Solariums allow you to heat and cool your room year-round, which gives you additional living space, no matter the season or climate. A solarium can also add an abundance of natural light to your home. Due to its access to sunlight and climate-controlled atmosphere, a solarium can be used as a greenhouse for plants. A solarium also gives you an ideal place to water and maintain your plants when the weather is too hot or too cold for them to survive outside. Patio Enclosures thermally-engineered extruded aluminum frames allow for year-round heating and cooling and provide structural integrity, exceeding local and national building codes. We offer three aluminum frame color options, including white, sandstone and a bronze finish. 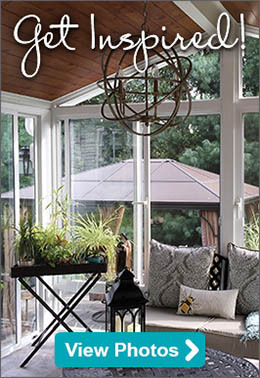 Our neutral color palette ensures that your solarium will coordinate with your existing home. You can also choose between a single slope or gabled roof to further match the style of your home. One of the major benefits of adding a solarium to your home is that it allows you to enjoy the outdoors from the comfort of the indoors, no matter what climate you live in. If you live in a cold climate, the optimal placement of a sunroom is on the south or southeast side of your home, because it will allow the room to receive the most sun year-round. If you reside in a warmer client, the ideal placement is a north-facing wall, which will prevent the room from getting too hot in the summer. When building a solarium, it’s important to consider energy-efficient glass. Patio Enclosures utilizes double-pane insulated glass, which provides better heating and cooling performance than single-pane glass; keeping your room warmer in the winter and cooler in the summer. Double-pane glass blocks UV rays 44% more efficiently than ordinary glass. We also offer an optional upgrade to Comfort-Gard® Plus High-Performance Glass, which is the most advanced glass available, to maximize your heating and cooling returns. For more information, view our sunroom types and options. Why Should I Choose Patio Enclosures for My Sunroom Addition? 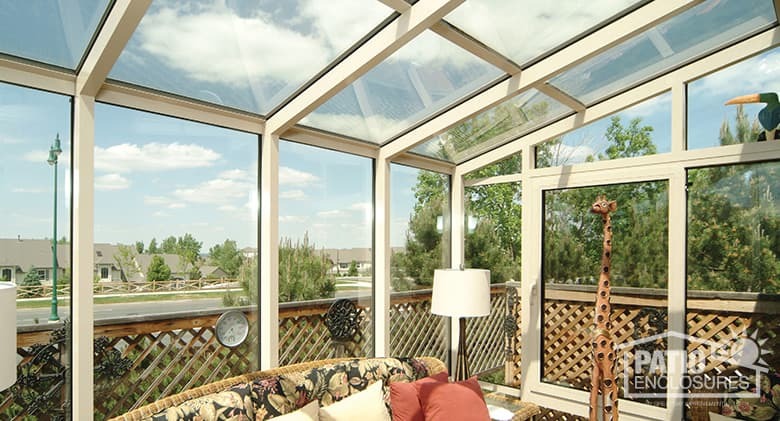 At Patio Enclosures, we are sunroom experts. For over 50 years, homeowners have trusted our brand. From start to finish, we work with you during each step of the sunroom addition process. We design, manufacture, install, guarantee and service each of our sunrooms, promising a one-stop-shop experience. Our solariums feature strong, aluminum glazing bars that provide maximum structural integrity even with floor-to-ceiling glass walls and a glass ceiling, which provide maximum views of the outdoors. We also offer endless design options for a sunroom addition to match the style of your home. Would you like to learn more about Patio Enclosures solariums? Schedule a free, in-home estimate, or give us a call at 1-800-230-8301 for more information.